you just stepped out off the immigration in Narita Airport and you realized you are more confused rather than feeling relieve to know that there are at least 5 possible ways to come to Tokyo. you thank yourself that you already knew very easy and cheap way to travel to Tokyo because you have read this blog BEFORE HAND!!! Everybody who has ever tried searching for information about transportation system between Narita Airport and Tokyo, definitely knows that there are way too many transportation that you can use! Some are expensive and some are too complication. Don’t be worried, my fellow traveler! Today, I will introduce you to the cheapest and the most convenient way to transport between airport and Tokyo city (from my personal experiences), and that is Shuttle Bus 1,000 Yen! by The Access Narita and Keisei Bus. They are Bus company who provide Airport shuttle bus service at reasonable price. In addition, both do not require advance reservation, so you can just pay before you get on. You can choose to get off the bus at either Tokyo station or Ginza station (same price!). Please check timetable in advance as the times will a bit different. Please be careful about time table unless you will end up staying over night at the airport. 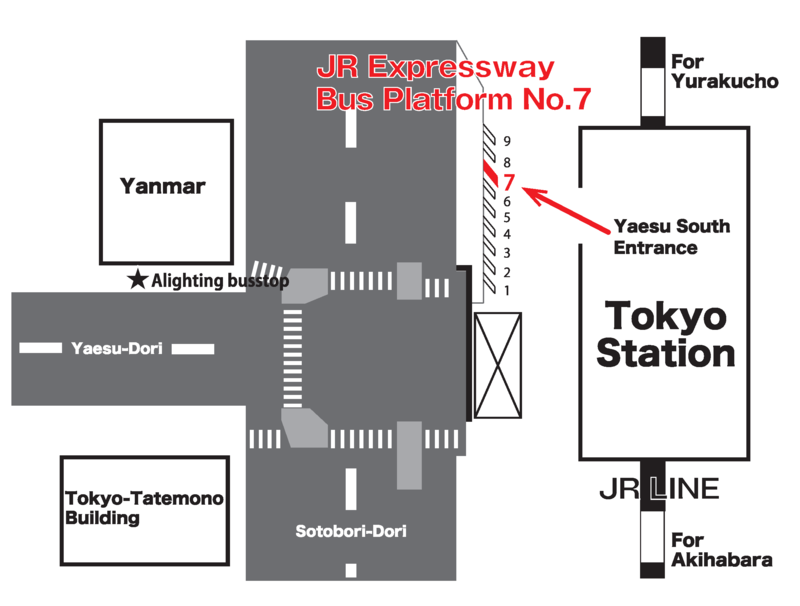 On the way back, you have to come to JR Tokyo station and look for Yaesu South Exit. Please head to Bus Platform No.7 where you will find your transportation and staffs. Let them know which terminal you would like to go and then you pay money to the driver. For those who have to catch early flight, the earliest bus will leave JR Tokyo Station at 5.40 am and arrive at each terminal as following time. ***Bus Stop No. 2 and No. 19 are both at the front of Terminal 2 (5 mins walk away from each other). Difference would be which one is much closer to your airline desk. Normally, it would cause you (at least) 2 hrs for Luggage Loading and Process at Immigration. So, you may make it for the 9 am flight if you take this bus. If your flight is much earlier than that??? Bus 1.10 am (Pink) is for Women and Kids (Less than 6 years old only). Somehow, these schedules look a bit tough as you may have to wait at the airport since late night before your flight. For suggestion, you can check train schedule of “Keisei Skyliner” which is an express train to the Narita airport. We have blog for you, please take a look on the link down below. For those who have to catch night flight, the latest bus will leave JR Tokyo Station at 18.10 am and arrive at each terminal as following time. If your flight is later than this, you can get on regular train or consider bus company that I will introduce to you next. They provide exactly the same service as Access Narita. Major difference would be location of bus stop and time schedule which is more flexible. You will get 100 yen discount if you make advance reservation online. ***Keisei Bus has much earlier morning schedule than Access Narita. It takes roughly 1.5 hr to travel to Tokyo and bus will depart every 20 mins. Despite wider time schedule, one drawback of this company is that bus stop is located a bit away from Tokyo station . You can access to bus stop by many exits from JR train and Subway. Please see from the map above. For those who have to catch early flight, the earliest bus will leave JR Tokyo Station at 4.15 am and arrive at each terminal as following time. For those who have to catch night flight, the latest bus will leave JR Tokyo Station at 21.00 pm and arrive at each terminal as following time. That’s all for the cheapest transportation between Tokyo city and Narita airport. I hope this blog is useful for you guys to plan your trip to Japan.